This package implements "Estimate to Complete (ETC)" or "Estimate Time to Complete", a project management tool used to track and forecast the performance of projects and individual tasks. 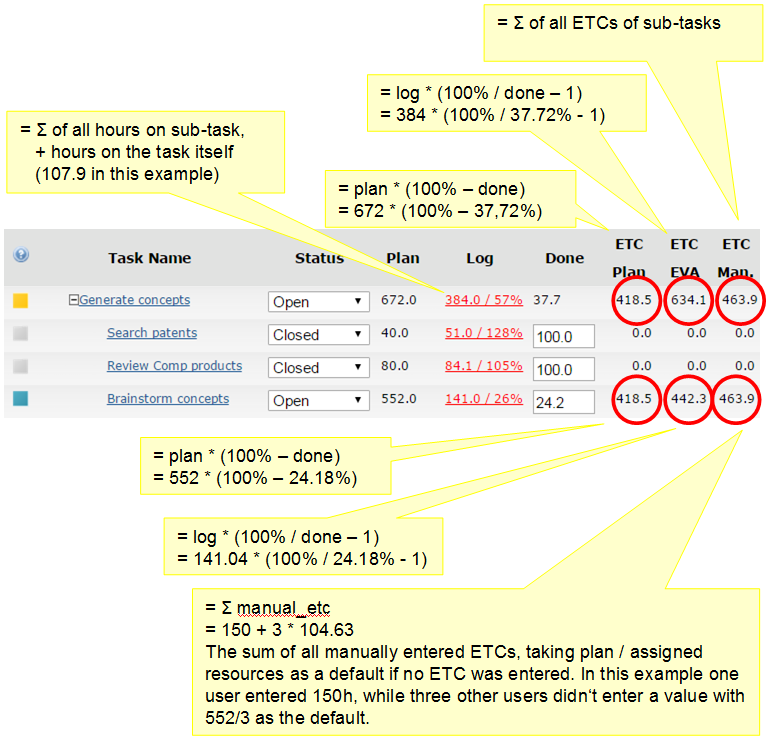 ]project-open[ ETC allows users to conveniently enter their estimates how many hours they need to complete a task. The entry form has been added to the normal timesheet entry screen, effectively avoiding additional effort on the resource side. Please contact us if you have questions or need training to rollout this functionality in your organization. The following screenshot shows a project ("Motor Development") where the current user is assigned to perform "Brainstorm Concepts" with 100%. The user is also assigned to perform other tasks, but without a specific percentage assignment. Therefore no ETC entry fields are shown. The ETC of the "Search Patents" and "Review Comp products" is 0.0, because these tasks have been finished. The calculation of the ETC of "Brainstorm concepts" is shown below. The following table with the detailed values entering in the calculation of ETC is available in the task's detail page. You can get there by clicking on the task's link ("Brainstorm Concepts" in the example above). Time Passed -27.3 Days since task start. Negative values indicatate that the task will start in the future. Time Passed % -40.6 Progress of the task as a percentage between start- and end date. Values < 0 indicate that the task will start in the future. Values > 100 indicate that end date of the task has passed. Planned Hours 552.0 Estimation of the work needed to complete the task. Typically imported from MS-Project or entered manually. Billable Hours 552.0 Normally same as planned units, but used for invoicing customers. Logged Hours 141.0 Hours logged by employees in the timesheet. Logged Hours % 25.6 Logged hours as a percentage of planned hours. (ignoring resources other than logged hours). Percent Completed 24.2 How much of the task has been finished (percent)? Entered manually by the PM normally. Should be greater or equal to logged hours %, otherwise the task is late. Resources Assigned 400.0 How many resources have been assigned to the task (percent)? One resource counts as 100%. (Planned) 418.5 Based on the number of hours left to work, according to planned hours and percent completed. (Earned Value) 442.3 Based on the logged hours that it took to achieve the current percent completed. (Manually Entered) 463.9 Based on manually entered ETC values (during timesheet entry), taking planned ETC as a default if no estimates are available. Watch out for outdated ETC estimates! (Planned) 552.0 = Planned Hours. (Earned Value) 583.3 Based on the logged hours that it took to achieve the current percent completed. (Manually Entered) 604.9 Based on manually entered ETC values (during timesheet entry), taking planned ETC as a default if no estimates are available. The history of the ETC entries by each users are available on the task's detail page. You can get there by clicking on the task's link ("Brainstorm Concepts" in the example above). im_estimate_to_complete_task_details_component Returns information about ETC and other estimation types. im_estimate_to_complete_task_history_component Returns information about ETC and other estimation types.